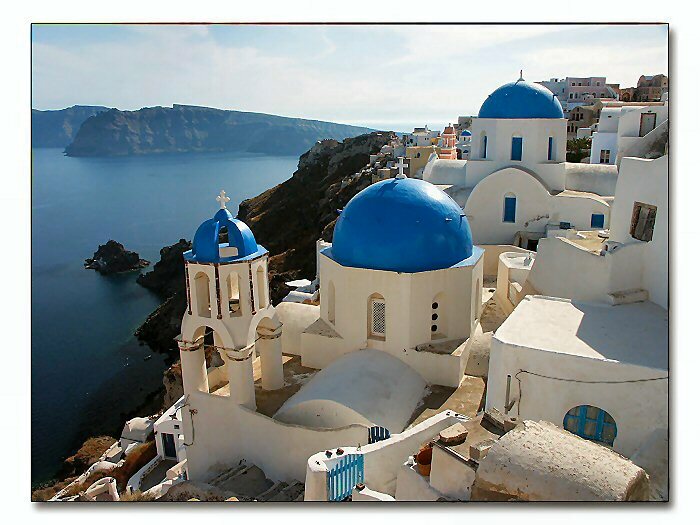 Oia is located high up on the island of Santorini, as is its capital, Thira. The island, is a narrow, crescent shaped remnant of the caldera of the Santorini volcano, left over after the catastrophic explosion of 1610 BC. That explosion destroyed the ancient settlements on the island of Thira, and the resulting huge tsunami destroyed the Minoan civilization on the island of Crete, 150 kilometers away. In the distance, the island of Thirasia can bee seen in the background of this photo. Thirasia is another remnant of the volcanic caldera. Image © by Vincent Bourrut photography (all rights reserved) used with permission. NOTE: The information regarding Greece on this web site is re-published from the World Fact Book of the United States Central Intelligence Agency. No claims are made regarding the accuracy of Greece Photos information contained here. All suggestions for corrections of any errors about Greece data should be addressed to the CIA.